Comments: Left alone to guard a pair of Jedi starfighters in the hostile landing bay of the Invisible Hand, Artoo is captured by super battle droids. Thinking quickly, he sprays his attackers with highly flammable lubricant and activates his booster jets, frying the battle droids' circuitry. 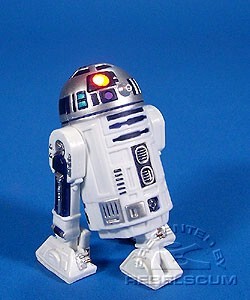 R2-D2 is a repack of 2005's ROTS R2-D2 figure. The cardback describes a scene from Episode III, although the coin is from Episode V.